If you’re trying to get to the bottom of all the current arguments about whether organic food is better for you, the first thing you might consider is just arming yourself with some facts. What Makes that Orange Organic? Maybe a better question is to ask is, what is not organic? If the product in your hands is labeled “natural,” “free-range,” or “hormone free” – you are about to purchase something that isn’t organic. These are just food labeling terms, and law does not regulate them. So, let’s say you actually do have a USDA certified organic product in your hands. If you buy it and eat it, is it better for you than its counterpart that was cultivated using conventional means? Fruits and vegetables grown organically are not treated with synthetic herbicides, fungicides or insecticides; nor were they grown using synthetic fertilizer. These chemical substances become part of the food, which you then ingest. If food is imported from other countries that have weaker (or even nonexistent) pesticide regulation, you could be eating food that has been treated with substances that are outlawed in the U.S. because they have been scientifically proven to be harmful to humans. A fat burning food by definition is a food that takes more calories to digest than it does to consume it. An example of this would be celery. It takes us more energy to actually chew up a piece of celery and the body to then digest the celery than the calories in the entire stick of celery. Our bodies need a combination of 3 macronutrients daily: protein, fat and carbohydrates. Protein is actually a thermogenic; which means by increasing your overall protein intake and reducing carbohydrates (not less than 40% of your daily calories) not only will cause hormonal changes that promote weight loss, but will boost metabolism through thermogenesis. It has been estimated as much as 30% of calories from protein are burned during digestion. What does this all mean? If you consume a typical boneless skinless chicken breast, containing approximately 300 calories, roughly 100 of these calories will be burned away during digestion. Warming up has many benefits. The main benefit to warming up is injury prevention because the blood will be pumping to an area, lowering the chance of a muscle pull or joint injury. Warming up isn’t just a safety precaution though – it also has positive effects on a bodybuilder because after a warm-up, strength and focus should be peaked. Warming up has many physical and mental benefits. A treadmill can help you lose weight, make your bones and muscles stronger, relieve depression and stress, and lower your risk for diabetes, arthritis, heart disease, high cholesterol, high blood pressure, and colon cancer. Use your treadmill at 1 percent incline to get the same workout as running or walking outside on a flat surface. Ignore all the “fat burning” and “cardio training” charts on the treadmill equipment. The key to burning calories is distance, not intensity. 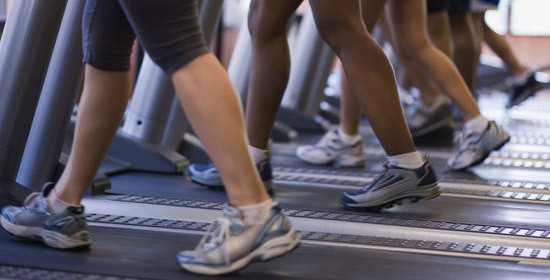 The longer or farther you go during your treadmill workout, the more calories you burn. Adding time and intensity at the same time can increase your risk for injury. When you are starting your treadmill program, gradually add time to your workout first. You can increase intensity later by adding speed or increasing the incline of your treadmill. Once you have built up your time on the treadmill, the best way to improve heart fitness is interval training. Do this by keeping the same speed and adding some incline or by just adding more speed. You can change the time, speed, and incline to get some variety into your workouts. Use music or television to help with your interval training. Work harder on every other song or during the commercials. Challenge yourself by monitoring your fitness. Record your heart rate at different grades and speeds after a set amount of time. After a few months you should see your heart rate numbers decreasing; then you will know you are making progress. Music is a great motivator. You can search the Internet under “treadmill music” and find songs that actually match different levels of treadmill exercise to the beat of the music. Maintain the right form on the treadmill: good posture, shoulders back, and your head looking forward, not down at the floor. Relax your hands and let your arms swing naturally. Keep the same length stride as you would outside. Don’t let your strides get short and choppy. Pay attention to where you are on the treadmill. Don’t drift to one side or backwards on the belt. Don’t be afraid to run: There is a built-in “spring” in the treadmill that will cushion your strides.